Size:20 cm x 15 cm ..
Colour:Black Decription: This compact, stylish and modern beauty mirr.. Description: It is made with HD mirror and high quality adjustable stand.With the white L.. Description: Comes with bright LED lights,no more worry in the dark 10 X Magnifying.. Description: This free standing three time magnifying mirror is a high-quality opti.. 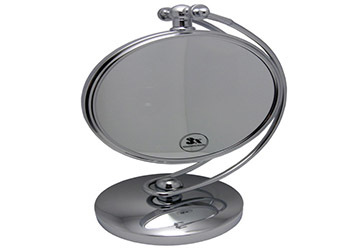 Description: This free standing three time magnifying mirror is a high-quality option for you.. Description: Its stainless steel construction and sleek modern design make this cosmetic mirr.. Description: This is Rose Folding Cosmetic Mirror with Handle Medium Black. Foid-style featur..